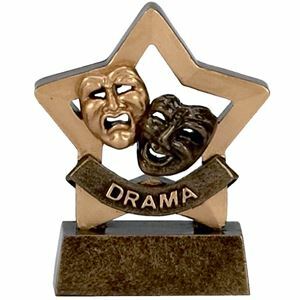 At Impact Trophies & Medals, we offer a huge range of drama trophies, medals and awards suited to any drama show, event or competition. 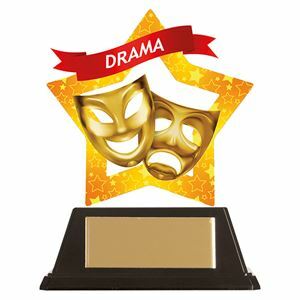 Our extensive range includes drama figure top trophies, glass drama awards and shield trophies for drama. Impact Trophies & Medals are a leading retailer of drama trophies & awards. 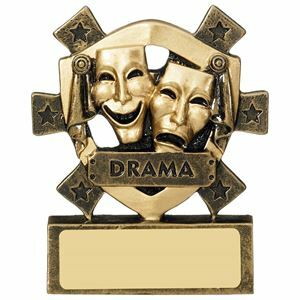 Great for personalisation, many of our handmade drama trophies and figure top drama awards can be personalised with free personalised text plate engraving and printed logo inserts, to perfectly meet all your drama presentation needs. 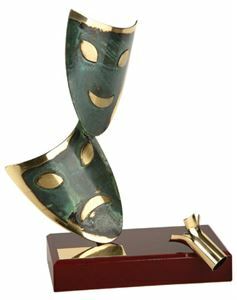 The Micro Drama Trophy features a two tone comedy and tragedy mask set standing on top of a rippled trophy riser. Made from premium resin with a high quality glaze, this trophy is set on a solid rectangular base with star detail. Offered at a great price and ideal for schools and drama clubs award presentations. The Drama Mini Shield is beautifully cast from high grade resin and finished in a glossy gold and antique gold lacquer. The mini shield is die-cut and displays the embossed tragedy and comedy masks with a DRAMA banner. This little trophy can be personalised with a FREE engraving plate - making this a great buy. Made from resin coated for a high shine finish, the Mini Star Drama Trophy is the perfect trophy to celebrate a superb dramatic performance. 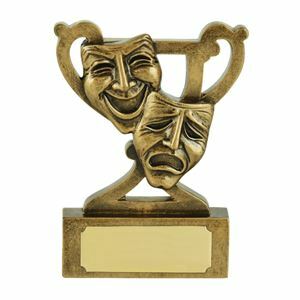 Set in front of a star backdrop, this trophy features a set of comedy and tragedy masks. 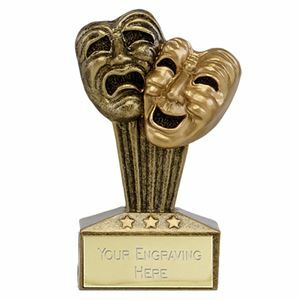 Beautifully moulded with fine detailing, the Drama Mini Cup Award features the comedy and tragedy masks set on a die-cut trophy cup. The small base can be personalised with a FREE engraving and is supplied in black picture box. This trophy is made from quality grade resin and finished in an antique gold varnish. Excellent price. This versatile little award would be perfect for a number of different events, from drama to tap dancing, or theatre to ballroom dancing. Whatever your event, this stylish plaque is sure to make an eye catching award. 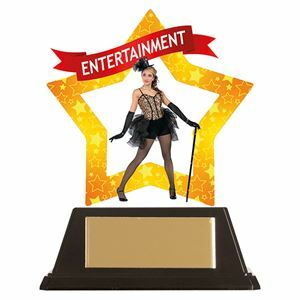 The Mini-Star Entertainment Acrylic Plaque is supplied in two pieces that simply click together, creating a star shaped plaque on a moulded black base. The plaque is printed with a high definition colour photograph to display a performing female dressed in black with a top hat and cane and is finished with a red banner over the top reading ENTERTAINMENT in white text. Forming part of the Mini-Star range of premium acrylic awards, this trophy offers excellent value for money. The Mini-Star Drama Acrylic Plaque features a UV printed colour image depicting gold comedy and tragedy masks surrounded by a gold frame and red banner printed with the word DRAMA in white text. Created from a premium acrylic, the star shaped plaque is supplied with a black trapezoid shaped base which easily click together to create this stylish award. The Star Drama Award is a gold coloured resin trophy. 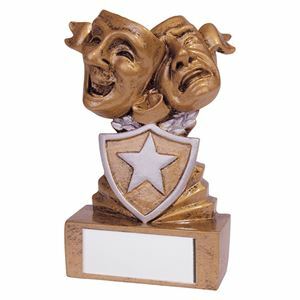 Set within a star shaped, star etched frame the Star Drama Trophy displays a pair of comedy and tragedy masks. 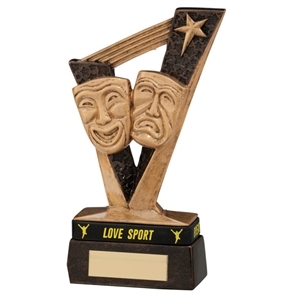 The small gold resin Victory Drama Trophy is formed from a large letter V with comedy and tragedy masks set against it and mounted on a small plinth. A shooting star tops the trophy. Made from a premium grade resin, the trophy is finished in gold and bronze and is coated in a high gloss varnish. This attractive award displays a high level of detail, despite its small size. Topped with a pair of comedy and tragedy masks, this gold resin award features a mini shield with a silver star displayed on the front of the short column and is mounted on a slim plinth. The Shield Mini Drama Award may be personalised to add a special touch. The Victory Drama Trophy showcases a pair of comedy and tragedy masks set against a large V for Victory topped with a shooting star. Made from resin, the trophy is finished in gold and bronze and has been coated for a high shine finish. 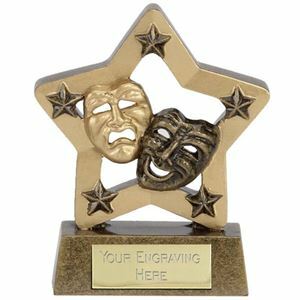 A golden star motif displays beautifully designed tragedy and comedy drama masks on the Star Blast Drama Trophy. The trophy stands on a triangular frame and is set on a small rectangular base which can be personalised. The award is made from superior grade plastic and varnished in an antique silver and golden trim finish. 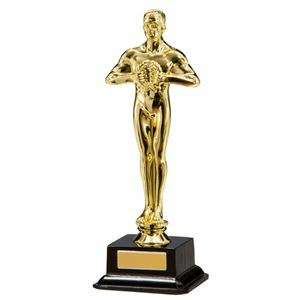 The Ovation Achievement Trophy is a traditional gold metal male statuette cast from quality resin and coated in a glossy gold glaze. Designed to emulate the classic movie style, this award is supplied in 2 sizes and will bring a touch of Hollywood glamour to your awards ceremony.